So you come home with 20 pounds of apples in a bag. No need to panic, I am here to tell you what to do. In about an hour or two you could be eating the best apple cake you have ever tried in your life. In fact, it so good that you will try to eat it all while declining tempting offers to exchange some of the cake for money and/or sexual favors. The cake is called “Sharlotka” and yes, there will be people who will tell you that this is not the right way to make it. Tell them to go f make their own Sharlotka, because this is the one and only way to make it and they don’t know what they are talking about. I would also like to warn “the creative types” not to post here with comments like “I added a pinch of salt to the recipe, some chicken, vegetables and a pie crust and now it’s a chicken pot pie”. I will ban you from this blog without regret. 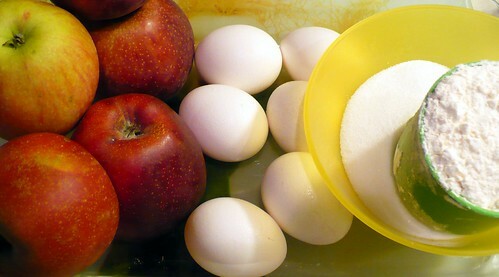 For this recipe you will need a baking dish with flat bottom, some apples, 6 eggs, 1 cup of sugar and 1 cup of flour. That’s it. Peel, core and slice the apples. 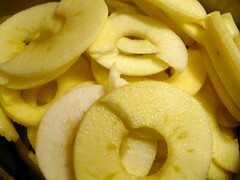 If you are a lady, cut the apples into uniform cubes of about 1/4 inches. 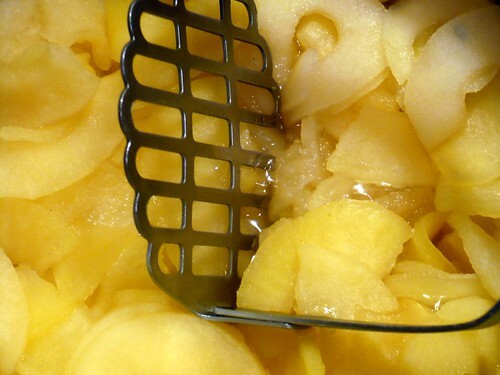 If you are a gentleman, reach for your favorite (apple-peeling) tool-device. 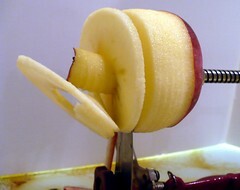 This machine cores, peels and slices the apples in one smooth motion. There is no excuse for not having it. Women and small children love it. 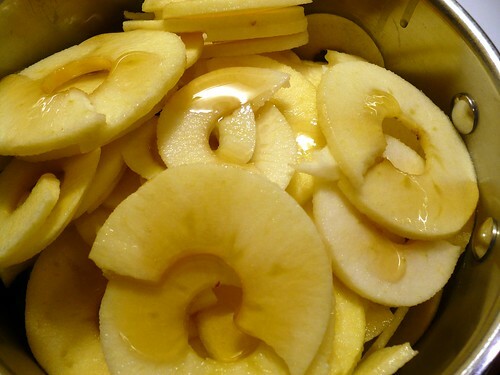 Hack processed apples into smaller pieces. 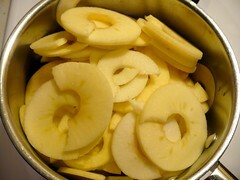 Peeled apples may brown after sitting on the counter. 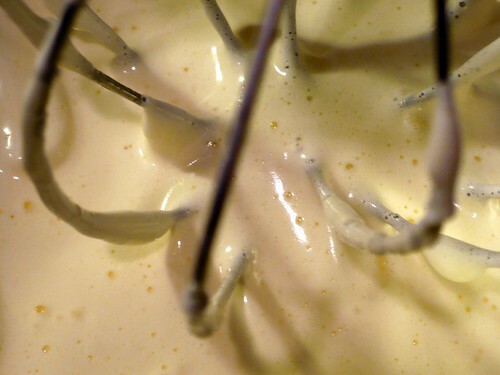 If you care, you can sprinkle them with lemon juice; I personally don’t care – it’s a cake,not a painting. 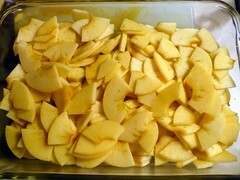 Place the apples into your baking dish. Here I clearly went overboard, peeling them was so much fun (unless you are a lady) that I went through a few too many. 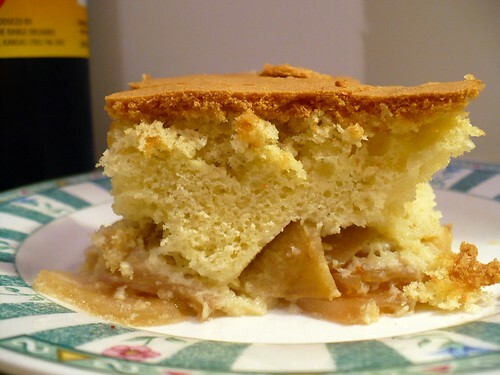 Don’t worry, you can never over-apple the apple cake. Now proceed to separate the yolks from the whites. 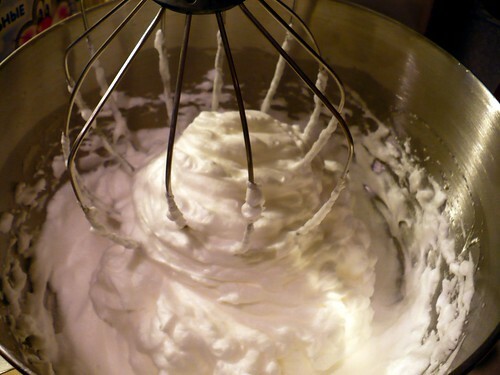 Whipping egg whites is easier if they are cold and no particles of yolks were accidentally mixed in. However, I did just that (not on purpose) and everything turned out OK. 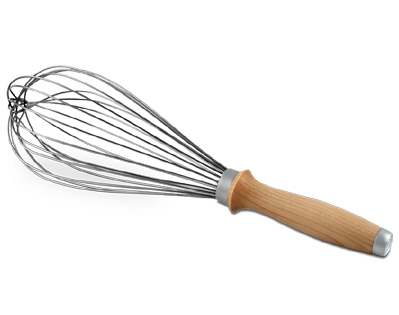 If you are an older person like me you would remember that back in the day we whipped egg whites with a whisk. It was tedious, boring and exhausting process. 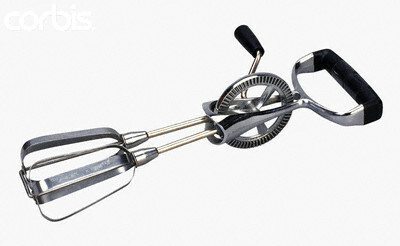 Fancy households had mechanical egg beaters, still a hassle and lots of cranking. Then came electric mixers and only here my dream to own a stand mixer finally came true. 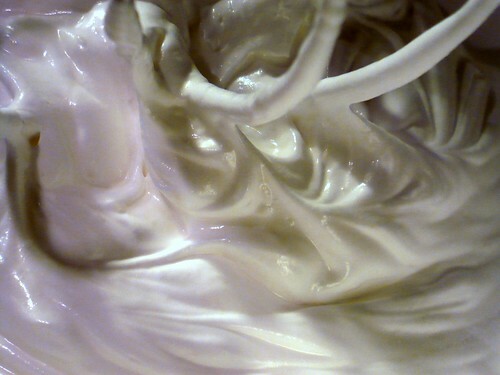 If you have one, place egg whites in the bowl and slowly raise the speed to “high”. If you don’t have the right equipment you can use any of the lesser tools. You will need to attain stiff peaks (not my stripper name) but it doesn’t have to be perfect. Slowly add sugar and continue whipping. The foam will become shiny and you will not be able to feel sugar crunch on your teeth. This may take 5 minutes or so. 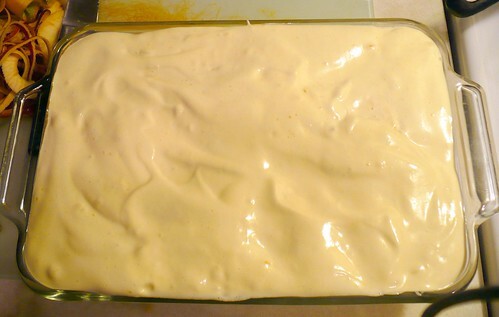 Add egg yolks and whip some more. Add flour and get it to blend in, no one likes unbaked chunks of flour in the cake, you won’t get any points for a crappy product. 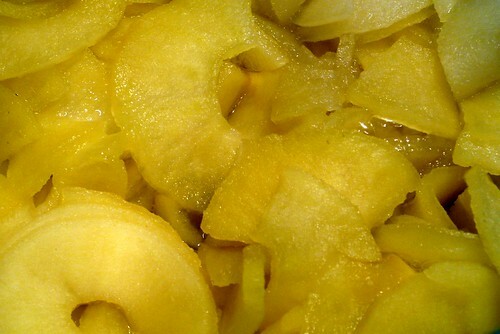 Pour the mixture on top of the apples and spread it evenly. In a 350F preheated oven it goes for an hour. Leave it alone. 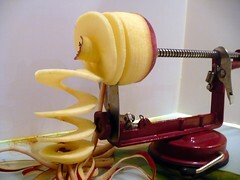 In the meantime you still have your apple peeler out and plenty more apples to use. 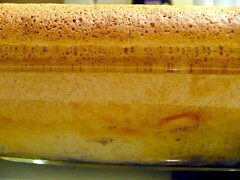 Add a small amount of apple juice, Sprite, water of other tasty liquid to a sauce pan and place it on the medium-low heat. Peel and slice as many apples as will fit. Pour some honey on top. Do not go crazy with it unless you like it too sweet. 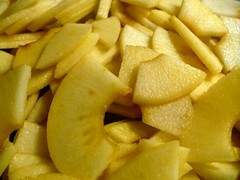 Cover and cook on medium low until apples look and feel soft. 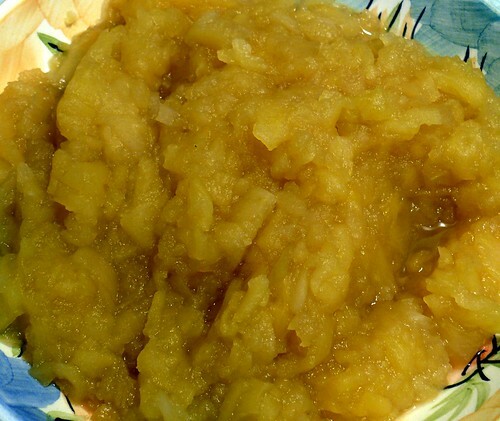 Use potato masher to make some apple sauce of the desired consistency. Let it cool, it really burns when hot. Now get the cake out of the oven. Test it by sticking a toothpick in the middle, if it comes out clean, you are done. 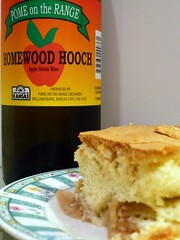 After the cake cools, get your favorite bottle of Homewood Hooch from the fridge and enjoy the cake. 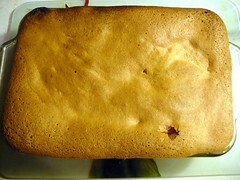 And this (to quote John McCain), “my friends”, is how you bake “Sharlotka”. Update: My blogger friend Johnna made her own gluten-free version.